Acting VA Secretary Peter O'Rourke describes the quick turnaround at the Memphis VA Medical Center as "nothing less than phenomenal" and says the facility now has the lowest mortality rate in the VA system, which operates 170 VA medical centers. O'Rourke's comments came during an interview with Memphis Medical News following his recent visit to Memphis. He added that VA Memphis "is undergoing great change with new leadership." He pointed to a study released in June by the Office of the Inspector General (OIG) that reported a drop in VA Memphis' once-high mortality rate - from 1.62 percent (December 2016) to 0.81 percent (March 2018). "Seeing what VA Memphis has done in a short amount of time is nothing less than phenomenal," O'Rourke said in late July, about a month after his Memphis visit. A longtime Veterans Affairs official and a 1998 graduate of the University of Tennessee, O'Rourke was appointed acting VA Secretary by President Donald Trump in May. The appointment came ahead of the confirmation hearing of VA secretary-designate Robert Wilkie. O'Rourke said he attributes VA Memphis' marked improvements to its relatively new leadership team headed by medical center director and CEO David K. Dunning, who took the helm in June 2017. The June OIG report outlined 13 areas for improvement at the Memphis VA facility, including the patient mortality rate, environment of care and deficiency with clinical staff training. On different occasions both O'Rourke and Dunning said the VA is constantly assessing and identifying areas that need improvement, so a number of the items in the report did not come as a surprise and were already addressed. "The OIG reports are always lagging a little, so we try to work with the IG collaboratively, and if they find serious items, they address those even before the reports come out," O'Rourke said. "So this one really keyed in on some mortality issues that we needed to address quickly, but David seized on that, and his new leadership team took that (area) as their central mission." Dunning further explained, "As with each evaluation, we welcomed the opportunity for an outside organization to assess the administrative processes and quality of care provided by staff here. Of note, the report did cover a period going back three years and did not reflect the most recent improvements. There is a significant difference in operations and quality during the last year." From parking to the flow of the patient visit, Dunning is planning upgrades to continue to improve the experience. Parking is a top complaint from veterans, and Dunning responded, "We have vastly improved parking, the No. 1 issue identified by our veterans, with the opening of valet parking, new off-site employee parking that will open an additional 92 spaces in August, and a planned ground breaking for an on-site parking garage in September." Turnover and staff shortages were also challenges for Dunning, but he has hired a surgery service chief and a quality management manager. Following his Memphis visit, O'Rourke reiterated that he is confident the right team is in place, as evidenced by the drop in the patient mortality rate. He said he was also happy about the addition of a new facility. "One of the exciting things that happened in Memphis recently is opening up their new ER. That really helped us in a number of areas that were really just structural in nature," he said. "... that [new ER] resulted in our being able to give our veterans sustained access to a provider in 30 minutes or less when they come into the ER." In addition, Dunning points to a new cardiac catherization lab and the scheduled arrival within the year of two new CT scanners, as well as a positron emission tomography (PET) scanner. Before departing Memphis, O'Rourke left a message not only for physicians at the VA, but in Memphis as well. "Director Dunning has really stabilized operations," he said. "We're not running away; we're proud of the success we've made, but we understand what that means. So it's a great place to work, it's a great team, and the problems that they may have heard about are what really represents the past. I think when we look toward the mortality rate moving downward drastically, some of the new construction projects, really just the look and feel - the Memphis VA is making it a much more attractive option for professionals." 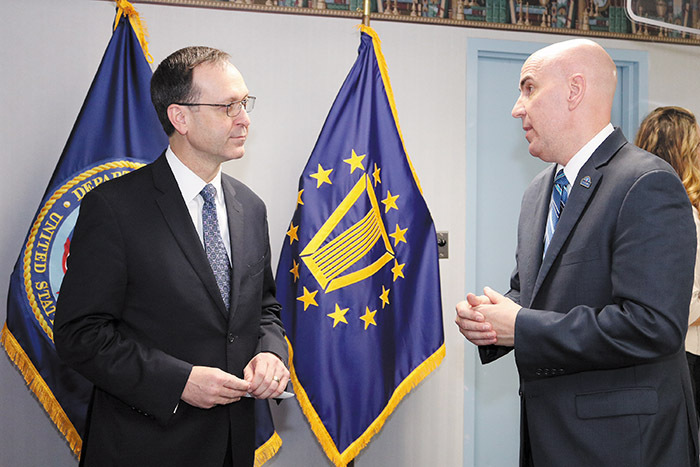 O'Rourke, who previously served as chief of staff for the agency and as its executive director for the Office of Accountability and Whistleblower Protection, feels veteran work has unique challenges compared with other areas of medicine. Plus, Memphis VA serves more than 200,000 veterans in the Mid-South. But he highlights the scale and opportunities as well, saying there are occasions for Memphis medical professionals to work with communities - such as police units on suicide prevention - and world-renowned researchers. O'Rourke also commented that he is proud of the advancements the VA is making in telemedicine. "We have a challenge in our system with the scale and geography we have," he said. "Whether it's folks who live in rural areas, we're addressing challenges at the highest level with bandwidth with FCC and working with major providers of broadband to make sure veterans get access to it." Not only can telemedicine help provide access to rural communities such as those surrounding Memphis, but it also reduces the healthcare cost for the VA and taxpayers. "Our work is never done, but we're excited about their progress," O'Rourke added, referring to the Memphis VA. "It justifies and solidifies that we have the right team there and that they're working on the right things."